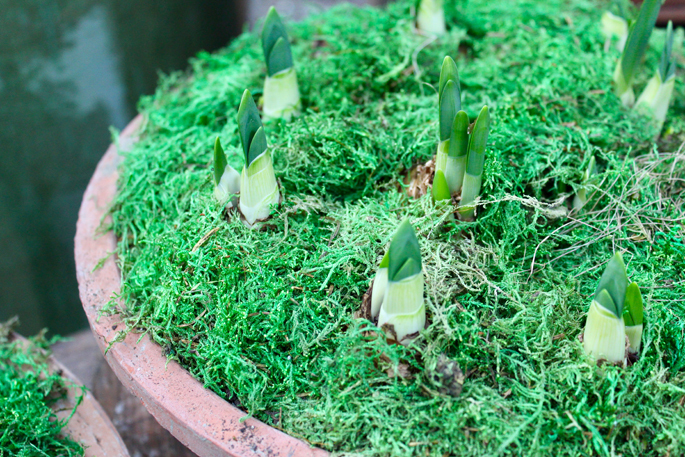 Paper whites are one of the easiest bulbs to force. Their pure white flowers, long strappy foliage and fragrance are a perfect living addition to interior holiday decorations. In our climate, they are also a reliable, easy-to-grow bulb in landscape beds and containers. Select a pot 3” – 4” deep and fill with soil. Plant the bulbs with the noses sticking above the soil. After planting, water them thoroughly! Then keep it moist. Paper whites will flower in most light conditions. However, for best results, place the container in a window area with a southern exposure. When the plants begin to flower, remove them from the direct sunlight and place in the coolest area of the home. This will help to prolong the flowering of the plants. Fill the vase with water to within ½ an inch of the bulb. Place the bulb in the top portion of the vase so that the flattened end rests in the vase and the point faces up. Replace water as necessary while avoiding wetting the bottom of the bulb. Once yellow shoots are 2” to 3” tall and roots have formed, place the vase in a medium light location. Keep the bulb in this location until the shoots turn green. Place the hyacinth vase in a brightly lit area with temperatures between 60 and 65 degrees avoiding direct light. Replace water as necessary until the flowers bloom – usually in two to three weeks.